A baby boy is fighting for his life in a Spokane hospital and his 19-year-old Coeur d’Alene father is accused of causing the bleeding in the infant’s brain by repeatedly handling him too roughly. James Blanchard has been charged with felony injury to a child. Bond was set Monday at $100,000 during Blanchard’s first appearance before Kootenai County magistrate Judge Clark Peterson. A preliminary hearing is expected within 14 days. When Peterson imposed a no-contact order prohibiting Blanchard from seeing his 20-day-old son, Noah, Blanchard said, “I want to be able to see my son again. I’ll do anything.” Blanchard’s mother, father, stepmother and two brothers attended the hearing and said afterward that Blanchard loves his son and would never hurt him. The family said Blanchard is engaged to Noah’s mother, Angelina Ray, who they said is 18. “He would never hit anybody,” said his younger brother, Andrew Blanchard, 18. However, the Kootenai County prosecutor’s office paints a different picture. In requesting Blanchard’s bond be set at $250,000, Deputy Prosecutor David Robins said he has “multiple witnesses” who will say Blanchard shook the baby forcefully, “would haphazardly toss the baby across the room,” and had slammed Noah down in his crib. Police reports say that Blanchard and Ray were homeless until they moved in with Heidi Ostafin in her apartment at 1042 N. 17th St. in Coeur d’Alene. Ostafin also had a roommate named Matthew Jenkins. Blanchard told police he, Ray and the baby were at a park in Post Falls with Ray’s family on Sunday and came home around 8 p.m. He said Noah was sleeping in his car seat in the living room when Ray left with Jenkins to get some takeout food from a Chinese restaurant. Blanchard said he took Noah out of the car seat and laid him on the couch then went into the kitchen to make him a bottle. When he returned about a minute later, Noah was having trouble breathing, Blanchard told police. Blanchard said he called Ray, who returned home and called 911. However, Jenkins told police that when he and Ray returned to the apartment, he told Ray to call 911 but Blanchard didn’t want her to. Jenkins said he had to yell at Ray to get her to call 911. 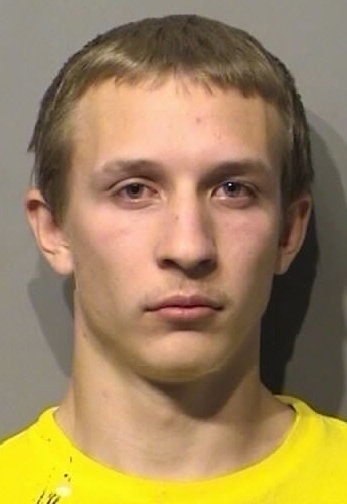 Ostafin and Jenkins told police they repeatedly have seen Blanchard handle Noah too roughly, including shaking him, kicking his car seat with him in it on the floor and dropping Noah forcefully into his bassinet from a height of six inches. He would also yell obscenities at Noah to make him stop crying, they said. Ray told police Blanchard didn’t kick the car seat, but that he was “rocking it.” She said she and Blanchard had been together three years but that their relationship had become more stressful since Noah was born, because they argue over each other’s parenting skills. Ray told police she’s spoken to Blanchard about being too rough with Noah. She said Blanchard gets frustrated with Noah when he cries. Doctors quoted in the police report said Noah Blanchard was bleeding in his brain in a fashion consistent with traumatic injury. The doctor “said this injury is typically caused when the brain bounces back and forth inside the skull, consistent with the baby being violently shaken,” the report said. Noah was originally taken to Kootenai Medical Center, then was transported to Providence Sacred Heart Medical Center on Monday morning, the police report said. If the baby is released, he’ll go into custody of the Idaho Department of Health and Welfare.